This year’s $1.7 million bailout of Carlsbad’s three-year-old golf course will bring the total amount of annual subsidies since its opening to $5.1 million. Four of the five council members who voted to tap city coffers again this time voted for each of the previous giveaways. Here’s a small sample of what three of them have said to explain their votes to save a failing enterprise. The most creative justification came from newly re-elected councilman Mark Packard. “We’re not subsidizing,” he claimed, “we’re ‘fronting’ the money. None of us on the council play golf, so we didn’t do this for our own benefit.” For him, keeping the course on life support amounts to a misnamed and selfless act. Each year since its August 2007 opening, the number of budgeted rounds of golf has fallen. The number for 2008 was 52,000. This year’s number of actual rounds is projected to be 42,000. That’s a 20 percent decline. Reaching next year’s budgeted goal of 44,000 seems unlikely, given the course’s track record. Follow the jump for the rest of the story. . .
Sure, we’d love to be outside skateboarding in Carlsbadistan. But thanks to today’s downpour we’re going to have to just watch it right here. 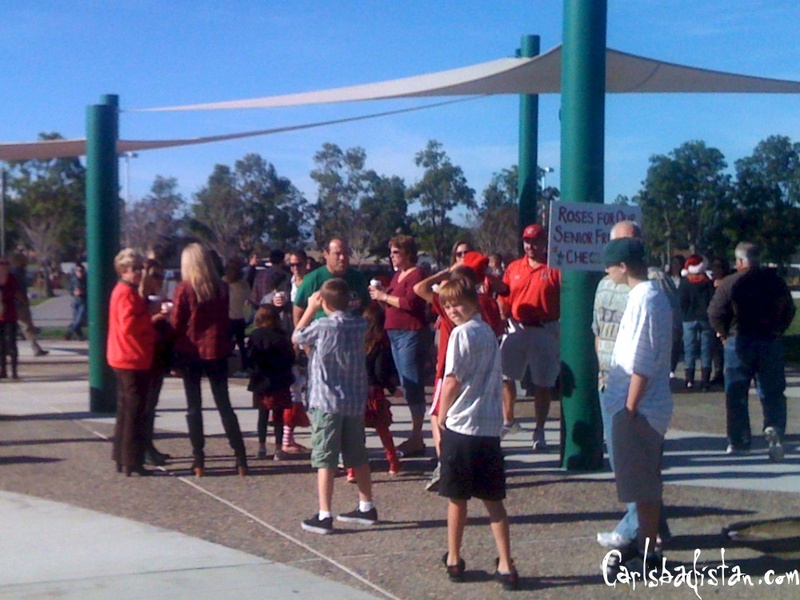 Hundreds of volunteers converged on the Pine Avenue Community Park this morning (December 24, 2010) at 10 AM to take part in the Fourth Annual Roses For Our Senior Friends project. Christmas is a time for family and friends, notoriously for kids. Unfortunately, many of our seniors spend the holidays alone and bored. In an effort to alleviate feelings of loneliness and spread a little holiday cheer, Roses for Our Senior Friends was created. . . What began as a father and daughter delivering roses to seniors on Christmas Eve in 2004, has blossomed into a large-scale volunteer event. Today, participants will deliver 2,500 roses to senior citizens at more than 20 different facilities from Carlsbad to Escondido. Merry Christmas, indeed. Click the link for more info on facebook. 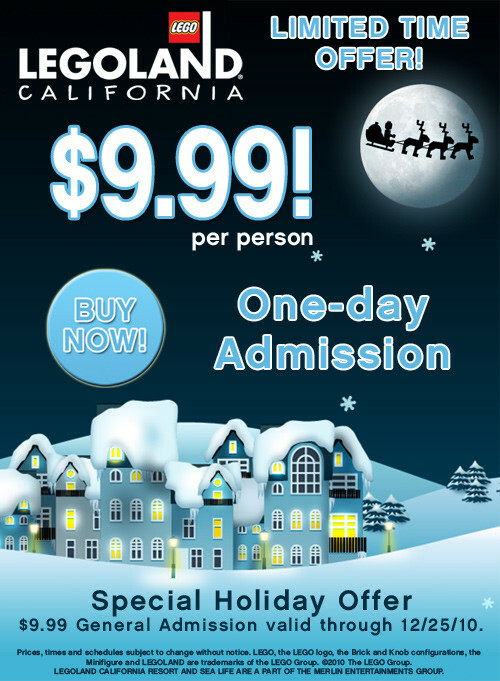 We’re usually pretty hard on Legoland California for what we think are their normally outrageous ticket prices, but from now until Christmas Day tickets to Legoland are only $9.99 per person. That’s right. Not $59, but $9.99 That is reason enough to go. In fact, we’re thinking we’ll probably visit the theme park for our third time ever. The deal was announced today on Twitter (@legoland_ca) and as might be imaged rocketed through the social web. Click the graphic for all the details or visit the Legoland facebook page. 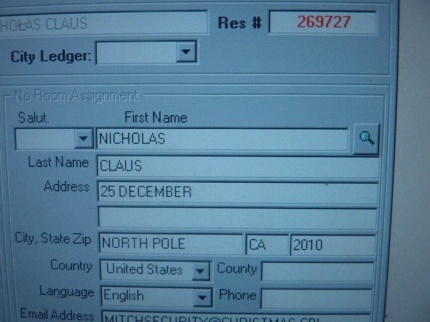 A member of the Carlsbadistan information gathering team just leaked this guest check in from the Carlsbad Inn. 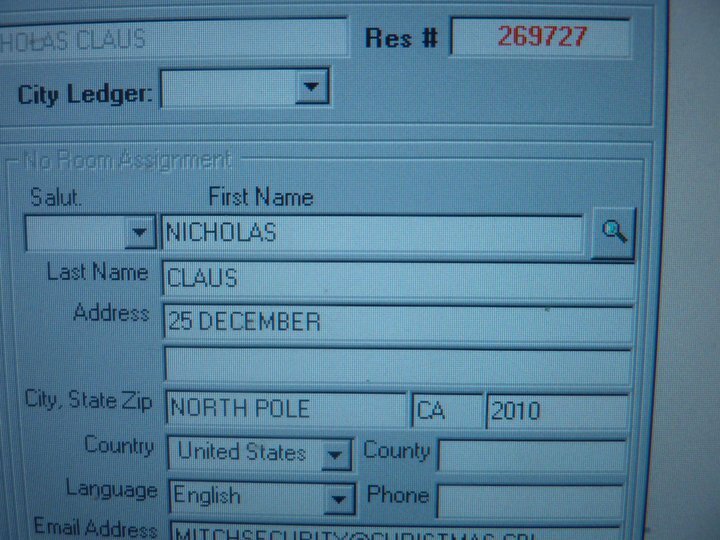 Looks like Santa Claus is indeed coming to town! 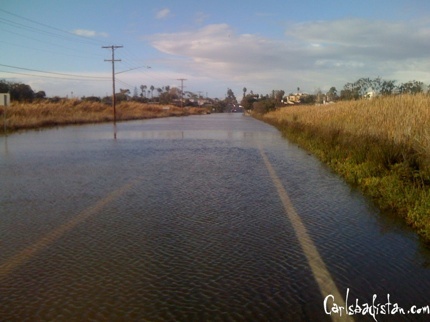 The storm clouds may be gone, but Historic 101 North into Oceanside certainly has a little more water on it than normal. Wonder if we can just leave it this way? 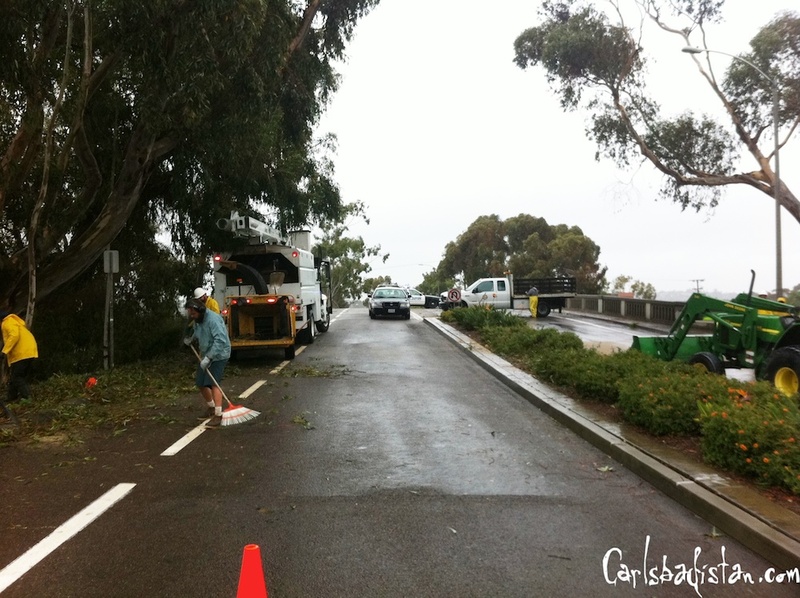 Downed Tree Branches Close Carlsbad Blvd. It seems Carlsbadistan made it through the storm of the decade mostly unscathed. Power remained on during the night and aside from a few downed trees everything seemed to be intact. A large branch closed Carlsbad Blvd. at Mountain View Dr. Police had both the North and South lanes blocked off at 10:20 AM as Carlsbad City crews worked amazingly quickly to get it all cleaned up. 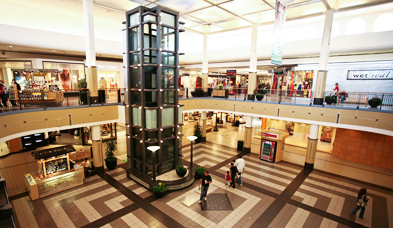 The Westfield Plaza Camino Real seems to be one big pile of problems for nearly everyone lately. If it isn’t empty spaces, or huge department stores that sit empty like hulking relics to a lost form of commerce, it’s the incessant crime that seems to occur around the mall. Last month, on Black Friday, a Zumiez store employee was robbed at gun point in the parking lot, then on Saturday night (December 18, 2010) a woman had her car stolen at gun point according to a story in the North County Times. Police said the 20-year-old victim had just left the mall shortly before 9 p.m. when the suspect, described as a black man about 30 years old, asked her for her car keys. He told her he would shoot and brandished a handgun. . . The woman got out of her car, gave the suspect her keys and the man drove away in an unknown direction in her red 2004 Nissan 350Z. . . .her car has a Michigan license plate BXN8034. Maybe Westfield should just throw in the towel and tear the place down. Just a thought. 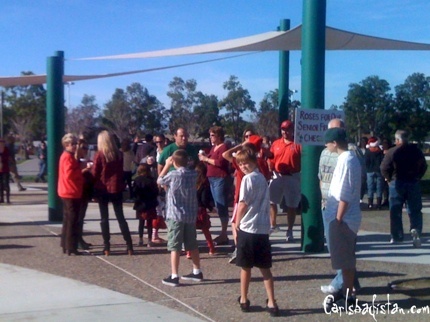 The San Diego Zoo’s Jungle Bells is one of the most fun evenings we’ve had at the Zoo in quite some time. The highlight was the Jumpin’ Elves show at Sydney’s Grill. Don’t miss it. Jungle Bells runs through January 2, 2011. Jumpin’ Elves shows are: 3:30, 4:30, 5:30, and 6:30 p.m. each day. Go early, stay late. 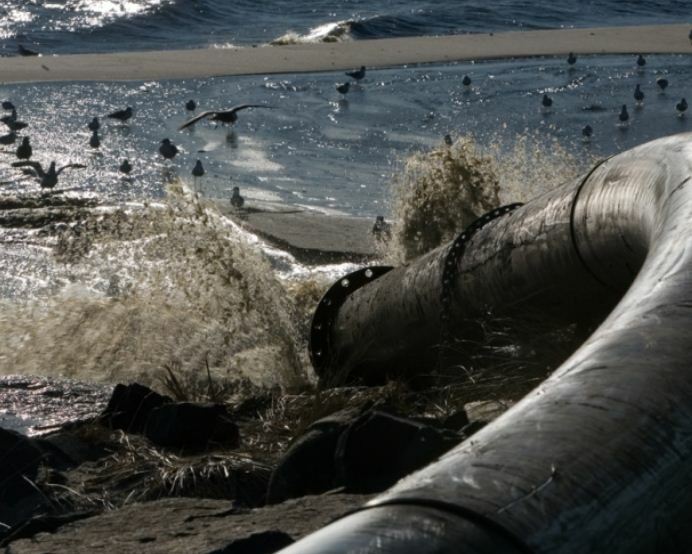 The black pipe snaking along Tamarack State Beach can only mean one thing—the dredging is back. And, according to a post on DredgingToday engineers will be pumping up the sludge from the bottom of the Agua Hedionda Lagoon and stinking up our beach all winter by blowing it out into the ocean from now until May 2011. The project consists of pumping 500,000 cubic yards of sand from the mouth of the lagoon to the beach in order to allow more cooling water to reach the Encina Power Plant. Beginning the week of Dec. 6, Cabrillo Power I LLC will position a dredging vessel and begin laying large black pipes adjacent to the seawall along Tamarack Beach. Approximately 100,000 cubic yards will be deposited on beaches north of Tamarack Avenue in January. Another segment of sand will be deposited between the jetties in February; the remainder will be placed south of the warm water jetty in March. The sand placement is expected to be completed by mid-April 2011. The equipment will be removed by the end of May. To be clear—they are not dredging so we can have a more beautiful beach. We already have more than enough sand. They’re dredging so the Encina Power Station can continue to make power to sell elsewhere.